T his article caught my eye since I grew up outside of Detroit and my mom is still a teacher in the city. I haven't been back in a while, but I've driven past the post-industrial wasteland parts of town — the abandoned factories with broken windows. 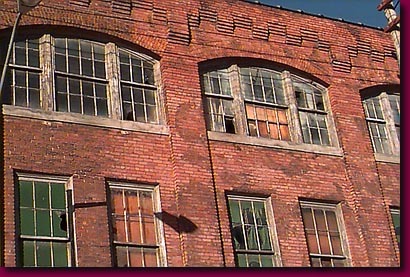 You can see a lot of this on the haunting “Ruins of Detroit” website (example photo shown here). Bob Herbert from the Times went and visited and saw the same things. He reaches some conclusions that those of us in the Lean blogosphere (including Evolving Excellence) have been saying for years — we have to continue manufacturing products in the United States. That is where economic growth and wealth are built in an economy (no offense to the important work done in healthcare). Services are important, but that economic activity is often a matter of moving around money that's already been created. Post-industrialization sounds trendy and “right” (you know, factory jobs must somehow be inherently dirty and demeaning) but post-industrial in Detroit means NO jobs, not a bunch of cushy professional jobs. Plus, if you want to avoid management behavior that's demeaning to workers, there's a lot of progress that needs to be made in hospitals, but that's a different story. Detroit and its environs are suffering the agonies of the economic damned because of policies, crafted at the highest national and corporate levels, that resulted in the implosion of crucially important components of America's manufacturing base. Those decisions have had a profound effect on the fortunes not just of Detroit, or even Michigan, but the entire U.S. economy. Herbert is right that we can't just blame government policies and tax policies. The rush to move manufacturing off-shore was driven by a rush for cheap labor combined with the mindset that manufacturing isn't cool. See Dell Computer, I mean Dell Inc., a leading manufacturer, I mean seller, of computers and electronics (and services, of course). The idea that the fallout from the wrongheaded economic concepts of the past 30 or 40 years could be contained, with the damage limited to the increasingly troubled urban areas while sparing prosperous suburbia, has now proved as phony as Bernie Madoff's fortune. There's been a loud minority that's been arguing AGAINST this seemingly inevitable tide for the last 30 years. The MIT Leaders for Manufacturing Program was created in the late 1980's to educate students and to draw leaders into the manufacturing sector, while supporting research and publications on the topic of American competitiveness. The program is now called “Leaders for Global Operations,” which says a lot in terms of the mood nowadays. Manufacturing isn't cool. Global is appealing. The program could have been originally called “MIT Leaders for American Manufacturing Program” but nobody is just an “American manufacturer” anymore. I'm not a protectionist. I think global trade, done responsibly with a level playing field, is on the whole good for everyone. But the mad rush to blindly move EVERYTHING overseas, gutting America's factories has been foolish, I believe. We need a revitalized industrial policy, including the creation of whole new industries, if American families are to prosper in the coming decades. If there is any sense of urgency about this in the hearts and minds of our corporate and government leaders, I've missed it. We could argue all day about what the “solutions” or “countermeasures” are to this problem. Thankfully, we have cases of companies moving manufacturing back to the U.S. And you have entrepreneurs like Eve Yen, who I interviewed here for my podcast and is also featured in IndustryWeek. We need more Eve Yens, in big companies and in entrepreneurial settings. “Can do” over a rush to outsource. Lean and other creative methods can be used to counter the high labor costs here – being close to customers and producing high quality with short lead times can often be a winning strategy. There are actually some thoughtful comments on the NY Times site for this including 3, 11, 24, and 25. Well done Mark. Having experienced the often misguided surge of production to far aware places attempting to exploit piece price without regard to total cost of ownership – delayed transportation, quality catastrophies, lost customer responsiveness, increased inventories and obsolescence, etc., we must look to lean principles to know we should simplify every flow, structure every activity, clearly connect every supplier and customer, and experiment at the lowest level possible toward perfection. This often one leads one to build supplier partnerships next door or even in our buildings.